Going beyond the occasional news clip from Burma, the acclaimed filmmaker, Anders Østergaard, brings us close to the video journalists who deliver the footage. Though risking torture and life in jail, courageous young citizens of Burma live the essence of journalism as they insist on keeping up the flow of news from their closed country. Armed with small handycams the Burma VJs stop at nothing to make their reportages from the streets of Rangoon. Their material is smuggled out of the country and broadcast back into Burma via satellite and offered as free usage for international media. The whole world has witnessed single event clips made by the VJs, but for the very first time, their individual images have been carefully put together and at once, they tell a much bigger story. 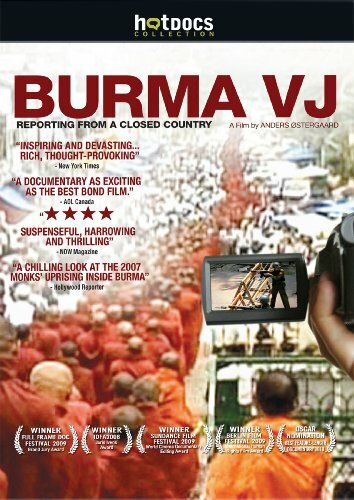 The film offers a unique insight into high-risk journalism and dissidence in a police state, while at the same time providing a thorough documentation of the historical and dramatic days of September 2007, when the Buddhist monks started marching. ”Joshua”, age 27, is one of the young video journalists, who works undercover to counter the propaganda of the military regime. Joshua is suddenly thrown into the role as tactical leader of his group of reporters, when the monks lead a massive but peaceful uprising against the military regime. After decades of oblivion - Burma returns to the world stage, but at the same time foreign TV crews are banned from entering the country, so it is left to Joshua and his crew to document the events and establish a lifeline to the surrounding world. It is their footage that keeps the revolution alive on TV screens all over. Amidst marching monks, brutal police agents, and shooting military the reporters embark on their dangerous mission, working around the clock to keep the world informed of events inside the closed country. Their compulsive instinct to shoot what they witness, rather than any deliberate heroism, turns their lives into that of freedom fighters. The regime quickly understands the power of the camera and the reporters are constantly chased by government intelligence agents who look at the ”media saboteurs” as the biggest prey they can get. During the turbulent days of September, Joshua finds himself on an emotional rollercoaster between hope and despair, as he frantically tries to keep track of his reporters in the streets while the great uprising unfolds and comes to its tragic end. With Joshua as the psychological lens, the Burmese condition is made tangible to a global audience so we can understand it, feel it, and smell it.